We know how valuable insight from another parent can be when it comes to choosing programs for your child. And we’d be surprised if you didn’t want to investigate - - we let 7 year olds use chop saws after all! Here you’ll find insights about our program from families and campers alike. Many families have volunteered to personally field questions from other parents and caregivers, so please reach out if you'd like us to put you in touch. And just in case you missed it on our homepage, check out our explainer video to really feel what camp is like. “What a phenomenal camp experience this summer for our boys! To say that the weeks spent with you were life-changing for them, especially our older son, would not be an overstatement. He came back from his week at Project Ember motivated, enthusiastic, excited, and having matured as a person. Our younger son cannot stop talking about the projects, the people, and the experiences he had during each session. Of course, they both want to return next summer. "Not only are Josh and Katie caring and honest people, they do not hesitate to challenge you to grow educationally and as an individual. They treat you as an equal, but also expect you to have the same open-mindedness when interacting with others. I know that my time at camp will always be fulfilling and memorable." "Katie and Josh are some of the best human beings I have ever met. They are genuine, hardworking leaders who encourage discovery, teamwork, and problem solving. I had an amazing time last summer and am pumped to take part in Project Ember this year." "Josh and Katie's leadership is exceptional. We entrusted our east coast kids to their west coast offering last year and it exceeded all expectations and was worth every resource it required (tuition, travel, time). Josh and Katie lead from a place of clear understanding of the nature of soul-centered, healthy, human development and have a deep reverence for the agency and creative capacity of kids and youth. The expectations for the week were both technically & personally challenging. Katie and Josh helped orchestrate the most amazing dynamic of healthy whole human community during that week of camp. It is a beautiful confluence of adult artisans mentoring the fiery, playful & visionary energy of teen aged youth with full circle learning and respect. And all of this wonder plays out on the stage of nature with trees, herons, gophers and the ocean often nudging the humans out of the starring roles! Yep. 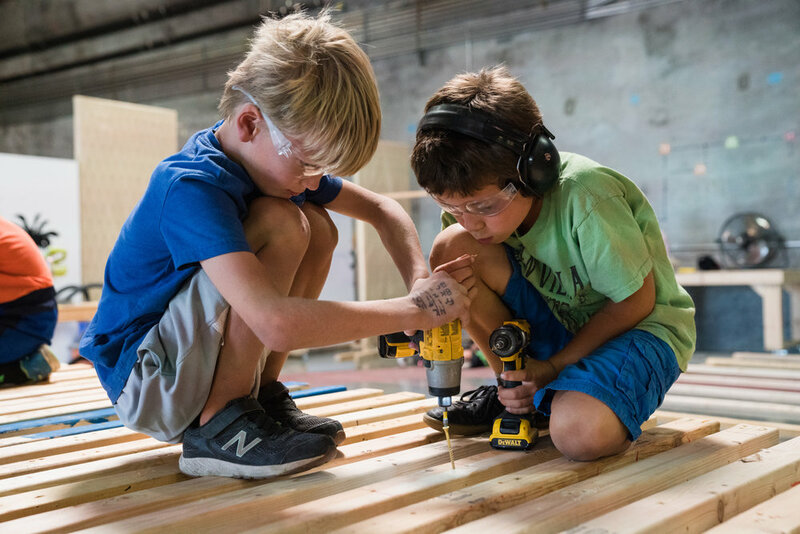 Our kids are returning this summer to participate in the maiden voyage of Project Ember. They are working, saving, and planning for it and have our full support!" "My son Ben had a fabulous day at Project Ember! Project Ember is a mix of Adventure Playground, Maker heaven with big tools and big imagination. It is a structured, focused environment where kids have the opportunity to work collaboratively on a very large, fun, and creative project under supervision of excellent counselors who understand kids and the importance of exploration. I highly recommend their camps!